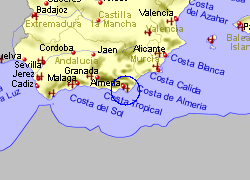 Map of the Almeria Ferry Port area. 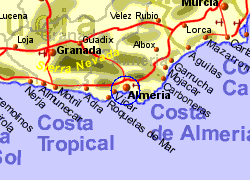 Almeria Ferry Port is located within walking distance of Almeria City Centre and the main train station (approximately 1km). 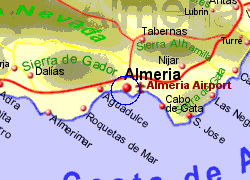 Almeria airport is at a distance of approximately 8km. Operated by Acciona with upto 15 crossingsper week,crossing time 6hrs. Operated by Acciona with upto 2 crossings per week, crossing time 9 hrs.